Police spent hours investigating in East Windsor after a teen told them he had explosives in his car, following a low speed chase. A 17-year-old East Windsor boy is in South Windsor police custody after a chase that ended on School Street in East Windsor, across from the police department, police said during a news conference. 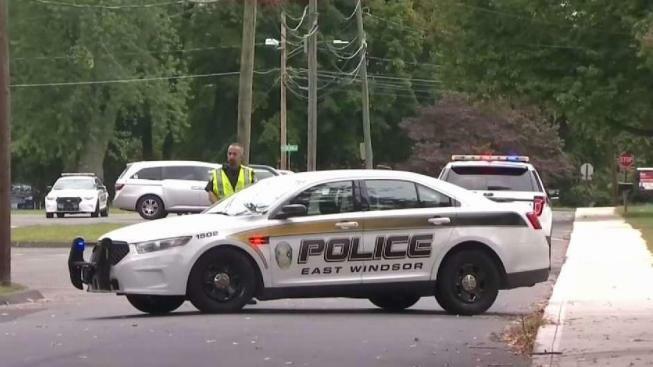 The incident started as a welfare check at a South Windsor insurance agency because the boy was reported to be acting strangely, according to East Windsor police. When officers reached out to him, the boy led them on a chase in a Mustang, police said. East Windsor police became involved in the investigation when South Windsor police alerted them that the chase had crossed town lines. During the chase, which was mostly at slow speeds, the teen went across lawns and through parking lots. At one point, he threw a folding shovel at police while trying to evade them, police said. The chase ultimately ended in a driveway on School Street, right across from the police department. After a brief struggle, officers took the boy into custody and he indicated there was a bomb in the vehicle, which prompted local police to contact the Connecticut state police bomb squad and evacuate several homes. While checking the teen’s car, the bomb squad found something that caused some concern, so they conducted two controlled detonations to destroy whatever the item was, East Windsor police said. No bomb has been discovered. The houses in East Windsor will be evacuated until police clear the scene. East Windsor police said the teen is “well known” to both agencies and they might file local charges. It's not clear what connection if any, he has with the insurance agency. No vehicles were damaged and no officers were injured, police said.